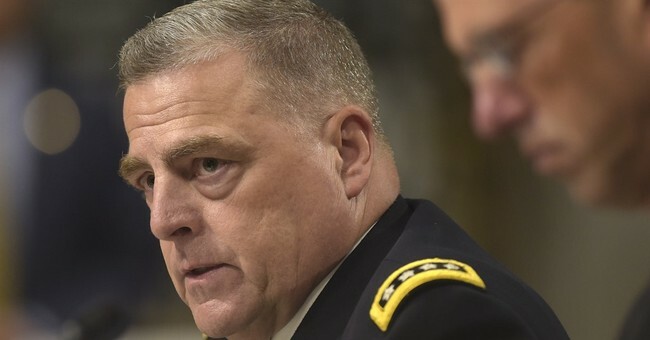 President Donald Trump officially announced he will be nominating Army Chief of Staff Gen. Mark Milley to serve as the next Chairman of the Joint Chiefs of Staff on Saturday. If confirmed, Milley will replace Marine Corps Gen. Joseph “Fighting Joe” Dunford. Dunford has been serving as chairman since 2015. Before that he had served as Commandant of the Marine Corps. The chairman is the highest-ranking officer in the U.S. military and is the top military adviser to the president. He commanded the 1st Battalion, 506th Infantry, 2nd Infantry Division; the 2nd Brigade, 10th Mountain Division; served as the Deputy Commanding General for the 101st Airborne (Air Assault); and served as the Commanding General for 10th Mountain Division. While serving as the Commanding General, III Corps and Fort Hood, he deployed as the Commanding General, International Security Assistance Force Joint Command and Deputy Commanding General, U.S. Forces – Afghanistan. Additionally, he served on the operations staff of The Joint Staff as the J33/DDRO, and as a Military Assistant to the Secretary of Defense at the Pentagon. His operational deployments include the Multi-National Force and Observers, or MFO, Sinai, Egypt; Operation JUST CAUSE, Panama; Operation UPHOLD DEMOCRACY, Haiti; Operation JOINT ENDEAVOR, Bosnia-Herzegovina; Operation IRAQI FREEDOM, Iraq; and three tours during Operation ENDURING FREEDOM, Afghanistan. He also deployed to Somalia and Colombia. Milley’s holds a Bachelor’s Degree in Political Science from Princeton University, a Master’s Degrees from Columbia University (International Relations) and from the U.S. Naval War College (National Security and Strategic Studies).